Softball Fields are regulated playing fields for the sport of softball. A variant of baseball, softball is played with a larger ball and a faster pace due to the shorter distances on the field. In softball, the centerfield, right, and left fences must be 250’ | 76.2 m from the apex of home plate. The bases on a Softball Field are spaced 60’ | 18.3 m apart measured from the apex of home plate to the farthest corner of 1st and 3rd bases, and from the same farthest corner of 1st and 3rd to the center of 2nd base. The pitching distance from the front of the pitching rubber to the apex of home plate is set at 50’ | 15.2 m.
How far is a Softball home run? The outfield fence in Softball is 250’ | 76.2 m (minimum) from the apex of home plate. What is the distance between bases on a Softball Field? 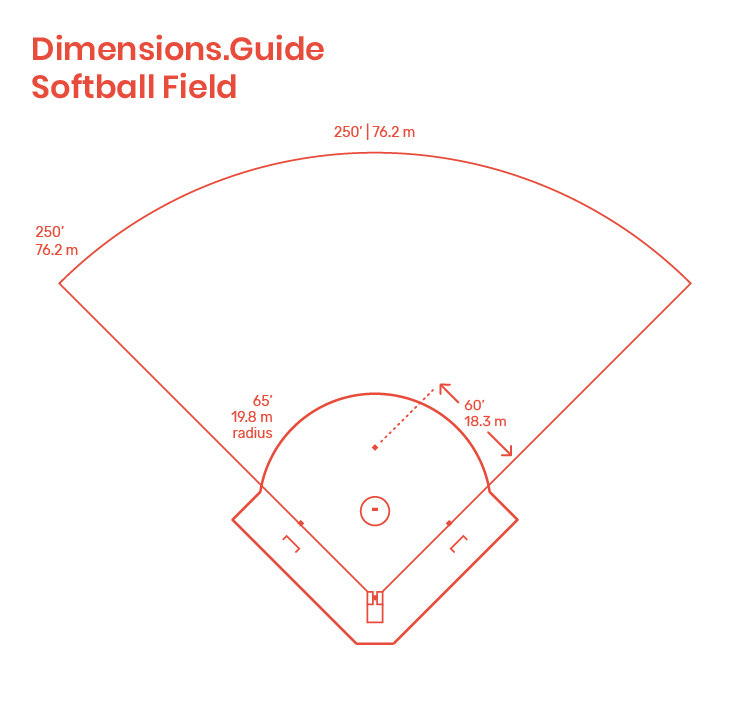 Softball Fields have bases spaced 60’ | 18.3 m apart measured from the apex of home plate to the farthest corner of 1st and 3rd bases, and from the same farthest corner of 1st and 3rd to the center of 2nd base. What is the pitching distance in Softball? The pitching distance in Softball is 50’ | 15.2 m measured from the front center of the pitching rubber to the apex of home plate.